· Sustainable development has been defined as development that meets the needs of the present without compromising the ability of future generations to meet their own needs. · Sustainable development calls for concerted efforts towards building an inclusive, sustainable and resilient future for people and planet. · For sustainable development to be achieved, it is crucial to harmonize three core elements: economic growth, social inclusion and environmental protection. These elements are interconnected and all are crucial for the well-being of individuals and societies. · Eradicating poverty in all its forms and dimensions is an indispensable requirement for sustainable development. To this end, there must be promotion of sustainable, inclusive and equitable economic growth, creating greater opportunities for all, reducing inequalities, raising basic standards of living, fostering equitable social development and inclusion, and promoting integrated and sustainable management of natural resources and ecosystems. · The Addis Ababa Action Agenda that came out of the Third International Conference on Financing for Development provided concrete policies and actions to support the implementation of the new agenda. · Implementation and success will rely on countries’ own sustainable development policies, plans and programmes, and will be led by countries. The Sustainable Development Goals (SDGs) will be a compass for aligning countries’ plans with their global commitments. · Nationally owned and country-led sustainable development strategies will require resource mobilization and financing strategies. · All stakeholders: governments, civil society, the private sector, and others, are expected to contribute to the realisation of the new agenda. · A revitalized global partnership at the global level is needed to support national efforts. This is recognized in the 2030 Agenda. · Multi-stakeholder partnerships have been recognized as an important component of strategies that seek to mobilize all stakeholders around the new agenda. · At the global level, the 17 Sustainable Development Goals (SDGs) and 169 targets of the new agenda will be monitored and reviewed using a set of global indicators. The global indicator framework, to be developed by the Inter Agency and Expert Group on SDG Indicators (IAEA-SDGs), will be agreed on by the UN Statistical Commission by March 2016. The Economic and Social Council and the General Assembly will then adopt these indicators. · Governments will also develop their own national indicators to assist in monitoring progress made on the goals and targets. · Chief statisticians from Member States are working on the identification of the targets with the aim to have 2 indicators for each target. There will be approximately 300 indicators for all the targets. Where the targets cover cross-cutting issues, however, the number of indicators may be reduced. · The follow-up and review process will be informed by an annual SDG Progress Report to be prepared by the Secretary-General. · The annual meetings of the High-level Political Forum on sustainable development will play a central role in reviewing progress towards the SDGs at the global level. The means of implementation of the SDGs will be monitored and reviewed as outlined in the Addis Ababa Action Agenda, the outcome document of the Third International Conference on Financing for Development, to ensure that financial resources are effectively mobilized to support the new sustainable development agenda. · The means of implementation—including how to mobilize the financial resources to achieve the sustainable development agenda—are a core feature of the new agenda. · In order to achieve the Sustainable Development Goals (SDGs), substantial investment will be required, in both developed and developing countries. This agenda will require the mobilization of significant resources—in the trillions of dollars. · But these resources already exist. There are far more than enough savings in the world to finance the new agenda. How to direct investment so that it supports sustainable development will be crucial for achieving our Goals. · Resources need to be mobilized from domestic and international sources, as well as from the public and private sectors. · Official development assistance is still necessary to help the countries most in need, including the least developed countries, to achieve sustainable development. · Climate change is already impacting public health, food and water security, migration, peace and security. Climate change, left unchecked, will roll back the development gains we have made over the last decades and will make further gains impossible. · Investments in sustainable development will help address climate change by reducing greenhouse gas emissions and building climate resilience. · Conversely, action on climate change will drive sustainable development. · Tackling climate change and fostering sustainable development are two mutually reinforcing sides of the same coin; sustainable development cannot be achieved without climate action. Conversely, many of the SDGs are addressing the core drivers of climate change. · The 17 Sustainable Development Goals (SDGs) with 169 targets are broader in scope and go further than the MDGs by addressing the root causes of poverty and the universal need for development that works for all people. The goals cover the three dimensions of sustainable development: economic growth, social inclusion and environmental protection. 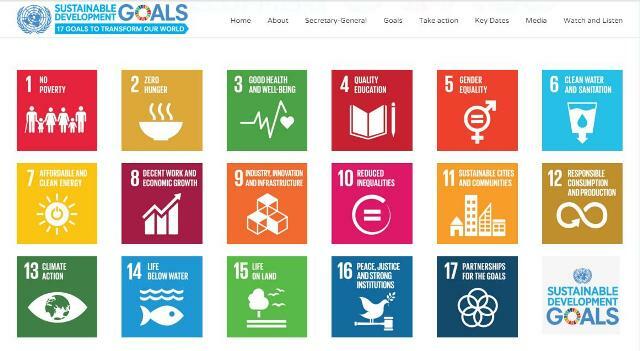 · Building on the success and momentum of the MDGs, the new global goals cover more ground, with ambitions to address inequalities, economic growth, decent jobs, cities and human settlements, industrialization, oceans, ecosystems, energy, climate change, sustainable consumption and production, peace and justice. · The new Goals are universal and apply to all countries, whereas the MDGs were intended for action in developing countries only. · A core feature of the SDGs is their strong focus on means of implementation—the mobilization of financial resources—capacity-building and technology, as well as data and institutions. · The new Goals recognize that tackling climate change is essential for sustainable development and poverty eradication. SDG 13 aims to promote urgent action to combat climate change and its impacts.